Timelesss Coffee – Relax. Enjoy Coffee More. There is no drink that says “cosy” and “luxurious” as much as hot chocolate. Just visualising a cup of hot cocoa makes me feel all nice and warm and instantly more relaxed. But such luxury comes with a few dark sides, one of which is the high sugar content that a standard cup contains. Can you seriously buy a sugar free hot chocolate that doesn’t disappoint? And with the added convenience of a K cup? Amongst the 500 varieties of K Cup, from the 75 brands none of them offers a sugar free hot chocolate option. And I searched for what seemed like hours. You are not thinking of leaving, are you? I do have a few (well four) alternative options for you, if you are willing to compromise a little. Buckle up because this is going to be one hell of a ride! And be prepared for some bumps along the way. What You Don’t Get- Sugar free. Having found out that a sugar-free hot chocolate K cup doesn’t exist, I bring you the next best thing. Swiss Miss Hot Chocolate K Cup. With 3 grams of sugar per K Cup these Light Hot Cocoa K Cups aren’t sugar free but they are low in sugar. To put this in perspective, an “ordinary” hot chocolate K Cup can have anything up to 6g of sugar in it. Each pack comes with 16 K Cups, giving you the chance to have your almost guilt-free chocolate treat time and time again. And these cups are very, very popular with buyers. People like the very chocolatey flavor and the fact that it tastes so rich. Buyers also like that this seems to be the only low sugar hot chocolate K cup that they can find. Are you willing to give option 2 a chance? Yes, it involves another compromise so let’s cut to the chase. The first alternative is to look at packets of sugar-free or low sugar hot chocolate or cocoa powders. Although these are not as convenient as using a K Cup, these will still work with Keurig machines. But any Keurig machine will dispense hot water. Just watch the video below to find out how. But if not, ignore me and read on! Calling all Keto and Paleo fans! The Keto Cocoa is not only sugar free but it is also gluten free. And it has no artificial flavors, sweeteners or colors. This powder mixes with hot water and is called a “cheat” product because you will not believe that something that tastes so great is sugar free. Keto Cocoa also contains MCTs (Medium Chain Triglycerides) which are a super powered “fatty acids” which provide you not only with bundles of energy and will help keep you in ketosis but they are also high in antioxidants. And people love this product- it has a truck load of great feedback. With many users saying that they can’t believe the taste! This is another sugar free hot chocolate mix which is aimed at Keto dieters. And what makes it unique? Well it is palm oil free and it is totally derived from coconut. It’s added MCT oils promise to be gentler on the stomach (than other similar products) and to help you with the fat burning process. And as a Non GMO, gluten free, palm oil free product, this jar of Keto Cocoa promises to be nearly as good for the planet as it is for you. This product is very different from the two hot chocolates reviewed above. Perhaps Nomu’s Skinny Chocolate most unique feature is that it is not a sugar free but a low sugar product. But it is also different because it only contains 20 calories per serving- and that it contains no MCT oils! This Skinny Chocolate Mix contains 60% cocoa with no artificial oils. Nomu claim that this mix will taste exactly like your normal hot chocolate but without all of the unhealthy stuff. And buyers have been overwhelmingly positive about how great this hot chocolate is. Loved by people who are just trying to lose weight or by followers of low carb diets such as the Keto diet. The taste is very rich and not very sweet which seems to be a much liked quality. And it is being used in a many more ways than just as a hot chocolate- it is being added to things like yoghurt to make a tasty treat. Try it and if you aren’t satisfied for any reason then Nomu will happily refund you. Let’s move onto option 3. What you don’t get- a sugar free option. OK, I know that I may have lost you at this point as this option might be a step (or a compromise) too far. But if your need for a hot chocolate K Cup is more important than your need for a sugar free variety, the next product might be just what you need. I have found one brand of K Cup that will enable you to have a full fat, high in sugar hot chocolate. And the K Cup is Grove Square. Grove Square offer dark or milk chocolate k cups. Each packet comes with 24 individual cups. If you want a standard hot chocolate, with all the added sugar. If the Keto diet and all the associated MCT oils don’t interest you, then this might be your go to K Cup. And what an amazingly popular product this is- buyers rave about it. Some users love it as their “go to” hot chocolate when they are in a rush, others have ditched drinking any other type of hot cocoa. One buyer is so in love with it that she hates it when the weather starts to get warmer. Have I got any readers left? Before you put your head in your arms and start to weep, let me present one final alternative to you. I am going to give you one final option before I hang my head in shame and tiptoe out of the room. This final choice is only for the dedicated, only for those who have plenty of time on their hands. What You Get- delicious sugar free hot chocolate. What You Don’t Get- It is not in a K Cup, it doesn’t use your Keurig coffee machine and it isn’t an easy or a quick “make”. What is a K Cup? A K cup is a small plastic container that contains enough coffee grounds to make a single cup of coffee. The plastic pod contains a filter and a foil lid and with over 500 varieties, they can be used to make a lots of different hot drinks, not just coffee. They are used in lots of different coffee machines but mainly ones made by Keurig. The K Cup is placed within a machine where the plastic is pierced and hot water is sprayed over it. How Much Sugar is in Hot Chocolate? Different hot chocolate mixes will have slightly different amounts of sugar in them. However, the Grove Square hot chocolate K Cup in this post has 6g of sugar in every 15g serving, which is 40%. The Keto chocolate mixes were sugar free and Nomu’s Skinny Chocolate had 2g of sugar in every 6g serving- which is 33%. One of the most popular and biggest selling hot chocolate powders is 77% sugar. In every 35g serving, there is 27g of sugar! How Many Calories Are in Sugar Free Hot Chocolate? 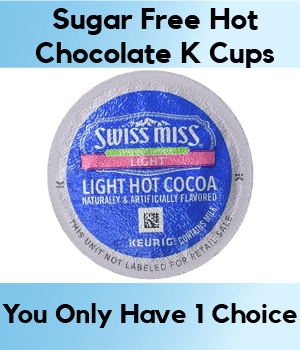 Once again, if I look at the two sugar free hot chocolate mixes that I reviewed in this post, Keto Cocoa and Kiss My Keto both had 70 calories per serving. And each serving size was around 12g. Does Starbucks Has Skinny Hot Chocolate? Starbucks does offer a skinny Peppermint Hot Chocolate but it is only available in the winter. In a 12 fl oz. serving, there are 120 calories and 12g of sugar. It’s standard hot chocolate is however a different beast entirely. In every 12 fl oz serving there are 320 calories and 34g of sugar. What is the nutrition of sugar free hot chocolate? Well, let’s have a look at the nutritional information for Giant Sport’s Keto Cocoa. With a serving size of 12g, this hot cocoa mix has 70 calories, 6g of fat, 3g of protein, 1.8mg of iron, 200 mg of potassium and 125g of sodium. Is hot chocolate good for a diabetic? I think that I need to say at this point that hot chocolate isn’t good for anyone! If you want a nutritious and healthy drink, then hot chocolate in any form wouldn’t be high on that list! It is safe for a diabetic to drink hot chocolate in moderation. Use diet or light versions of hot chocolate and use 1% or 2% milk instead of full fat milk.